What strikes us particularly about the origin of the Christian Mothers' Confraternity is that it was so spontaneous. It was not something that was foisted upon Catholic women, but something that grew out of themselves. It was one of those providential movements of the lay apostolate by which the Holy Spirit so often renews the spirit of the Church or of some group within the Church. It was at a time, about the middle of the 19th century, when the modern forces undermining family life first began to lift their heads, that the Christian Mothers reacted in a spiritual and spiritualizing movement. It was a movement of self-defense and self-preservation. In various parts of France, and especially in Lille, mothers began to gather to pray with and for one another, and their children, to discuss their problems and to advise one another regarding the Christian rearing of their children. The movement gradually solidified, and on May 1, 1850, the first conference of Christian Mothers was held in Lille, France, under the leadership of Louise Josson de Bilhem, the wife of a court official. In the course of time, the mothers sought and found recognition from the bishop for their growing organization. Once that approval was given, the organization grew with leaps and bounds, throughout France and the neighboring countries, and soon over a million women were enrolled as members. At present there are six Archconfraternities of Christian Mothers in the world. They are located in Paris, Rome, Regensburg (Ratisbon), Cracow, Einsidlen, and Pittsburgh. The society found its way into America at an early date, and on the 16th of January, 1881, the Confraternity of Christian Mothers canonically erected in St. Augustine's Church (now known as Our Lady of the Angels Parish), Pittsburgh, Pa., was raised to the rank of an Archconfraternity with the right of affiliating other Confraternities wherever the Ordinary approved. Since then over 3,400 Confraternities (including ours at Saints Cyril and Methodius in 1951) have been affiliated with the Pittsburgh Archconfraternity directed by the Capuchin Friars. The Confraternity of Christian Mothers has for its object the Christian home education of children by truly Christian Mothers. 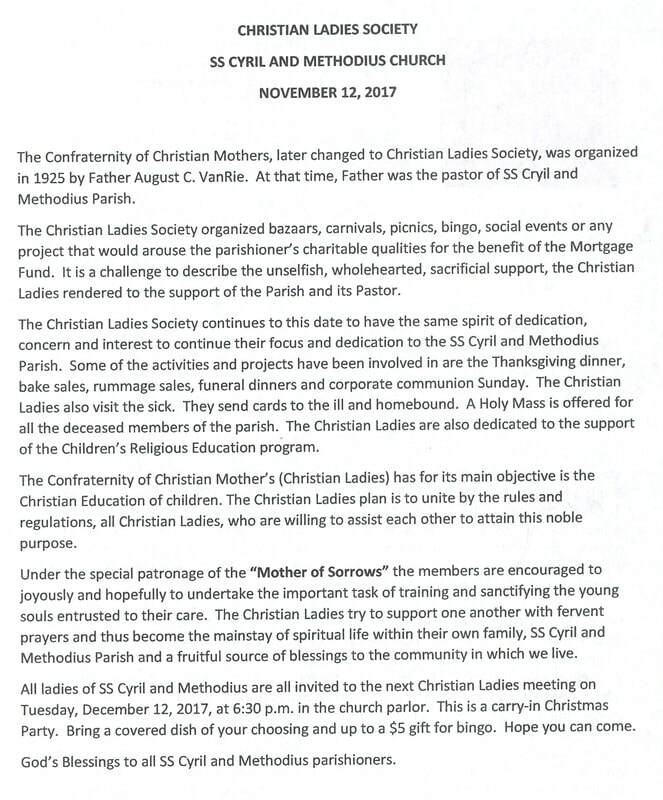 It plans to unite by the observance of its rules and regulations all Christian ladies, married or widowed, who are willing to assist one another to attain this noble purpose. Under the special patronage of the "Mother of Sorrows" the members are encouraged joyously and hopefully to undertake the important task of training and sanctifying the young souls entrusted to their care. They are schooled to edify one another by word and deed, to support one another by fervent prayers and thus become the mainstay of spiritual life within their own family, and a fruitful source of blessings to the community in which they live. This is the principal aim of all Confraternities affiliated with the Archconfraternity.